For the next few months, I will be teaching a pre-k class at the homeschool co-op that we attend on Fridays. 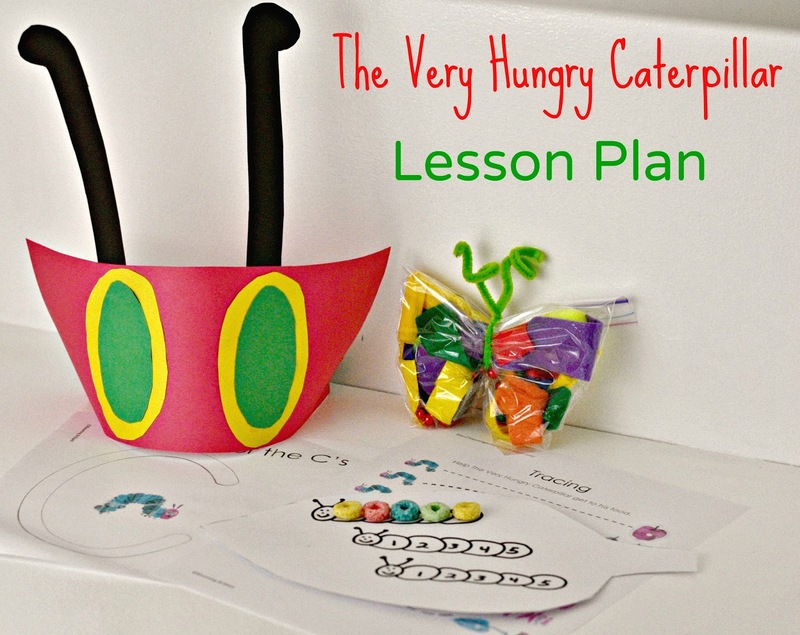 My first day was today, and I spent the past week putting together a Very Hungry Caterpillar lesson plan. I would be lying if I said I wasn't a little scared going into teaching this class, but everything worked out great, we finished right on time, and I think the kids had fun. If you want to replicate this lesson plan in your class, co-op or even at home for your own children, you can find all the components I used below. Worksheets: Tracing practice and Color the C's from the packet on Blooming Brilliant. This activity pack is free, and there are a wide range of other worksheets you can add for older children or longer class periods. Snack Time and Counting Practice: For this, I cut a leaf shape out of white cardstock, and then drew on three little caterpillars. I made the circles of the different segments of the caterpillar about the size of a fruit loop. In class, we practiced counting from 1-5 and recognizing the numbers by placing fruit loops on them. After the activity was done, it was time for fruit loops and apple juice. Very Hungry Caterpillar Hat Craft: I got this idea from itmom. All the pieces were cut out ahead of time, so all the kids had to do was glue on the antennae and eyes. Then, I measured each child's head and stapled the back closed so it would fit them. 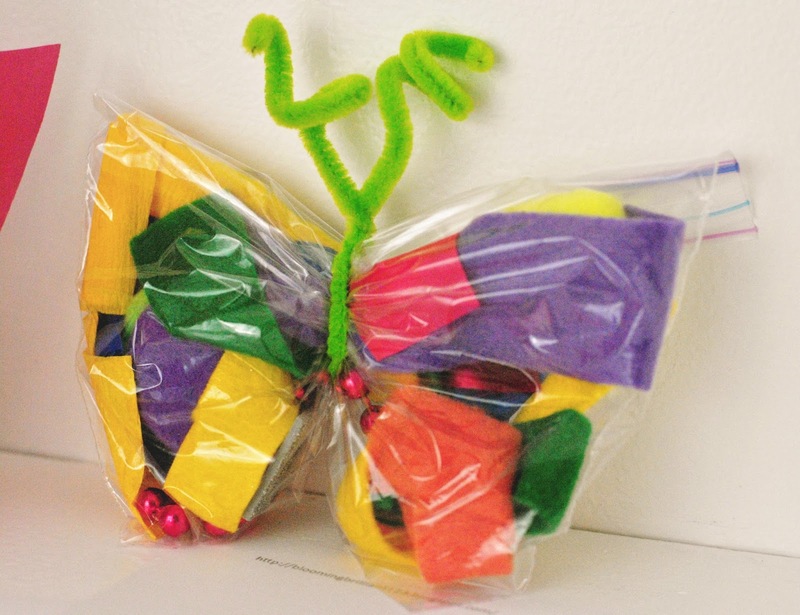 Beautiful Butterfly Sensory Craft: This is an extremely easy craft that the kids really loved. The different textures and colors play well with children who are very sensory based. I basically took all kinds of odds and ends out of my craft supply, including different colored scraps of felt, cut up strings of beads, shiny red fabric squares, glitter foam pieces, and even streamers. The children chose what they wanted in their zip lock bags, and then the whole thing was tied closed with a green pipe cleaner. If you have older children, or need the class to last longer, there are a ton of additional Very Hungry Caterpillar ideas available online. If you decide to use this lesson plan, I hope your children enjoy it as much as ours did! How fun and colorful - Counting with the Froot Loops on the caterpillar is genius. I have to do some of these when my nephew comes to visit as I still have that book on our bookshelf, I could not part with it even though Amber is grown up! oh that is so cute! My kids would love this lesson! My 5yr old son loves The Very Hungry Caterpillar, and although he isn't home schooled, we could easily participate in some of these activities on the weekends. This is one of my favorite children's books - I can't wait to try this with M! How creative! Love the fruit loop idea. I love the fruit loop caterpillar! Such a fun and colorful lesson plan. I love that it is multi-sensory. How cute. You are going to have a great year of co-op. Your lesson plan looks awesome. I love the counting lesson/snack time. It's so creative and fun. How cute!! Thanks for these ideas, I don't homeschool but still like to do a lot of learning based activities at home. Very cute!! I love that story! What an adorable craft. My nephews would love doing this. This is really cute!! Kudos to you! I love this! I could do this with my son!! My younger kids would love this! I love Eric Carle! One of my favorite children's book authors! This looks like such a fun lesson plan! I'm huge into story extenders so I really love these ideas. Early learning through play is the best! I really love the colors on this art. And it also looks good on kids t-shirts to. Can we get this printed on shirts?